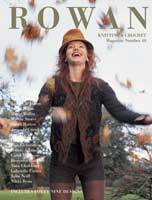 The Autumn / Winter 2007 edition of Rowan Magazine features handknitting and crochet designs from a whole host of designers including Marie Wallin, Kaffe Fassett, Sarah Hatton, Sarah Dallas, Erika Knight and Leah Sutton to name just a few. The new Autumn Winter season heralds a focus on the aesthetics of yarns - their texture, beauty and colour. Mohair is the important fibre of the season, as well as loose hand spun type roving yarns which add a home made feel. Inspiration for garment design comes from the return to everything natural with emphasis on the homely, cosy and hand made looks. Rowan is promoting three stories for Autumn/Winter 2007: Tundra, Highlander and Reflection. Each of the stories is delightfully styled to inspire the knitter and introduces garments which are both beautiful and very wearable. 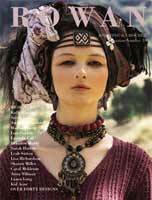 Rowan's Spring and Summer 2007 magazine features handknitting and crochet designs from Kaffe Fassett, Martin Storey, Marie Wallin, Sarah Dallas, Antoni & Alison, Sarah Hatton, Leah Sutton, Sharon Miller, Brandon Mably, Lois Daykin, Gabrielle Carter and Nina Chakkour. The new Spring/Summer season is inspired by a strong yearning for simplicity and natural principles. At a time of environmental, economic and political uncertainty, we see fashion returning to nature, honesty and security. To reflect this need for simplicity, Rowan is promoting three stories for Spring 2007; Secret Garden, Medinas & Minarets and Promenade, Each of the stories is simply styled and showcases garments which are both beautiful and easy to wear. This season we also see the introduction of a new yarn within the magazine: `Damask' is a lovely linen and viscose blend and will be available in eight subtle, space dyed shades. The new Autumn Winter season is inspired by the eclectic mix of simplicity, adornment, nature and fantasy. Fade to Grey, Kindred Spirit and Legend show garments which are both beautiful and very wearable. Each of the stories is simply styled in a way to inspire the knitter and this season sees the introduction of two new yarns within the magazine: ‘Tapestry’ is a lovely wool and soya bean mix and will be available in eight beautiful, rich, blended space dyed shades. ‘Romance’ is a light and airy chunky yarn with a subtle sparkle and will be available in six pretty pastel tones. This season also sees the exciting introduction of our new sizing. Over half of the womenswear designs within the magazine will be available from size 8 to 22, with the remainder being available from size 8 to 18 or from size Small to XL. Menswear will be available from size Small to XXL. Photographed on location in Sicily by Gisella Toress and styled by Emma Freemantle the Spring / Summer 2006 issue of Rowan Magazine shows a return to femininity in both styling and colouring. The Provence story shows this trend beautifully with lace, ruffles and flowers. This theme is continued in the Aqua Marine story with its simple seaside feel. The Tribal storymakes the dramatic statement of the season with its stronger use of colour and design. 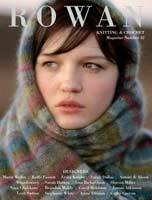 Fabulous new book of Rowan designs for Autumn 2005 with traditional knits for both men and women, taking their inspiration from the British landscape. Yarns in natural fibres of tweed and plaid, with an original use of asymmetry and unusual fastenings. Shapes that are fitted and classic, hinting at vintage influences but with from a more modern angle. Vibrant exciting chunky knits in an explosion of colour and textures. This book contains something for everyone. Features hand knitting and crochet designs from Kaffe Fassett, Antoni and Alison, Clare Tough, Kid Acne, Louisa Harding, Sarah Dallas, Martin Storey, Brandon Mably, Carol Meldrum, Leah Sutton, Sharon Miller, Laura Long, Lucinda Guy, Lois Daykin, Theresa Venning, Emily Blunt, Sarah Hatton, Lisa Richardson, Amanda Crawford, Stella Smith, and Anna Tillman - Wow! 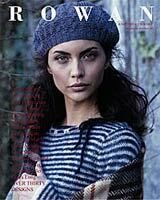 For all your summer knitting and inspiration look no further than Rowan Knitting Magazine 37. All skill levels are catered for in the easy to read patterns and charts, and the regular features and articles provide plenty of reading material too. Exciting new designs for the modern knitter! A Kidsilk Haze poncho, a chunky knit cardigan, a butterfly sweater and much more! All skill levels are catered for in the easy to read patterns and charts, and the regular features and articles provide plenty of reading material. Features over 30 designs from Kim Hargreaves, Kaffe Fassett, Martin Storey, Sarah Dallas, Sharon Miller, Louisa Harding, Brandon Mably, Sasha Kagan, Leah Sutton, Carol Meldrum, Tomoko Yamanaka, Laura Long, Marion Foale and Anna Wheeler. Featured yarns include 4 ply Soft, Kidsilk Haze, Kid Classic, Felted Tweed, Plaid, Wool Cotton, Lurex Shimmer, Chunky Cotton Chenille, Polar and the Yorkshire Tweed family (4 Ply, Aran, Chunky, and DK). Rowan's 25 year anniversary issue of it's now collectible seasonal magazine celebrates with over 30 designs across its beautifully photographed fashion pages. Rowan's long standing designers such as Kaffe Fassett, Kim Hargreaves and Sasha Kagan, join the new generation names of Leah Sutton , Sharon Miller, and Carol Meldurm, to bring a mix of traditional and modern, with one defining characteristic - Rowan yarn and the style it brings. The fashion stories, split over four themes from urban to nostalgic, natural to elegant , are joined by a good editorial mix including the regular Master Class and a look at Rowan's own story and the people who have contributed to the company over the years.